Department of Obstetrics & Gynecology, Sultan Qaboos University Hospital, Muscat, P.O. Box 38, PC 123, Sultanate of Oman. *Address correspondence and reprints request to: Department of Obstetrics & Gynecology, Sultan Qaboos University Hospital, Muscat, P.O. Box 38, PC 123, Sultanate of Oman. Gowri V, Al Shukri M, Al Khaduri M, Machado L. Clinical and Histological Profile of Surgically Managed Benign Adnexal Masses Oman Med J 2014 May; 29(3):239-241. Objective: To study the clinical and histological nature of benign adnexal masses managed surgically. Methods: A retrospective descriptive study in a teaching hospital in Oman of all the women who had surgical management of benign adnexal masses from January 2008 to May 2012. Data pertaining to age, parity, presenting symptoms, imaging and tumor markers performed and the surgical intervention done on those women with benign adnexal masses was collected from the electronic health records of the patients. Results: There were 198 women during this period operated for benign adnexal masses. The most common benign neoplasm was mature teratoma of the ovary followed by endometriosis. Conservative surgery in the form of ovarian cystectomy was necessary in three fourths of women and in about just less than 50% of women, the procedure was completed laparoscopically. Conclusion: The most common benign tumor was teratoma but laparoscopic approach, which is the standard of care in these women, was possible only in just about 50% of the women. Keywords: Adnexal masses; Benign; Laparoscopy; Laparotomy; Surgery. An adnexal mass (mass of the ovary, fallopian tube, or surrounding connective tissues) is a common gynecologic problem. They represent a spectrum of conditions from gynecologic and nongynecologic sources. Early diagnosis and intervention is essential especially in adolescent girls and young women of reproductive age group in order, to conserve the ovarian function. Pregnancy related conditions like ectopic pregnancy and miscarriages are diagnosed easily with a positive pregnancy test and managed accordingly. Pelvic ultrasonography (US) remains the imaging modality of choice to detect and characterize adnexal masses. About 90% of adnexal masses can be adequately characterized with US alone.1 The tumor markers have to be tailored to the age, complexity of the mass and history. This study was intended to analyze the clinical and histological diagnoses of all women surgically managed for benign adnexal masses including during pregnancy. This was a retrospective study from January 2008 - May 2012, conducted at Sultan Qaboos University Hospital. Patients who had surgical intervention were identified from the operating room register. Epidemiological information on age parity, presenting symptoms, tumor markers and type of imaging, mode of surgery (laparoscopy/laparotomy) and the type of surgery performed were collected from electronic health records after approval by the ethics committee. Performing tumor markers on patients with adnexal masses was selective in our practice. The cut-off values for the tumor markers (according to the biochemistry laboratory in our hospital) were 0.5 IU/L for Human Chorionic Gonadotrpin (HCG), 35 U/mL for Cancer Antigen 125 (CA125), 37 U/mL for CA 19-9, 7 U/mL for alpha-fetoprotein (AFP) and 214 U/L for lactate dehydrogenase (LDH). HCG was performed mainly to exclude pregnancy. The total number of patients who had surgical intervention was 198. Some women did not turn up for surgery after diagnosis. The mean age of the patients was 32.8 (11-72 years) and the median age was 30 years. Adolescents were around 8%. The histological characteristics with the mean age for each category and the surgical approach are shown in Table 1. Mean parity was three and the parity distribution is detailed in Table 2. The main presenting complaint was abdominal pain (60%), followed by infertility (19%), and in 12% the mass was an incidental finding. Ultrasound was the primary modality of imaging in 90% and computerized tomogram (CT) in about 8% of the patients. The remaining had MRI. Almost one-third of the patients needed CT or MRI as a second modality of imaging. With ultrasound alone, correct diagnosis was made in two-thirds of patients; with combination of ultrasound and CT or ultrasound and MRI, histological diagnosis was made in nearly 90% of patients. Of the 198 women, 11 were postmenopausal (51-72 years of age), wherein 6 had serous cystadenoma, 2 had mature teratoma, 1 had fibroma, 1 had hemorrhagic epidermoid cyst and 1 had hydrosalpinx. In about 46% of patients, cystectomy was done laparoscopically and in another 10% laparoscopy had to be converted to laparotomy. Laparotomy was the main approach in the remaining 44% for the following reasons: concomitant hysterectomy (33% of laparotomy group), size of the adnexal mass more than 12 cm in 26% of the laparotomy group, advanced endometriosis in about 10%, hemodynamically unstable patient condition in 4% and current pregnancy in another 6%. However, out of the 198 benign adenexal cases, 31 were categorized as suspicious for malignancy based on age, history, and radiological features and in those cases, surgical approach was planned as for likely malignant pathology (laparotomy). The biggest mass removed was a 22-cm sized mature teratoma performed by laparotomy. The biggest serous cystadenoma removed laparoscopically was 17 cm. Table 1: Frequency of histological diagnoses and mode of surgery in 198 patients. Serum human chorionic gonadotropin (HCG), Cancer Antigen 125 (CA125), Cancer Antigen 19-9 (CA 19-9), alpha-fetoprotein (AFP) and lactate dehydogenase (LDH) were performed in 82%, 83%, 44%, 52%, 32%, respectively, and they were found to be elevated in 2%, 23%, 7%, 0% and 2% of the tested patients, respectively. HCG elevations were all due to pregnancy. The LDH elevations were all in patients with sickle cell disease where it is expected to be elevated due to hemolysis and those patients who had mature teratomas. 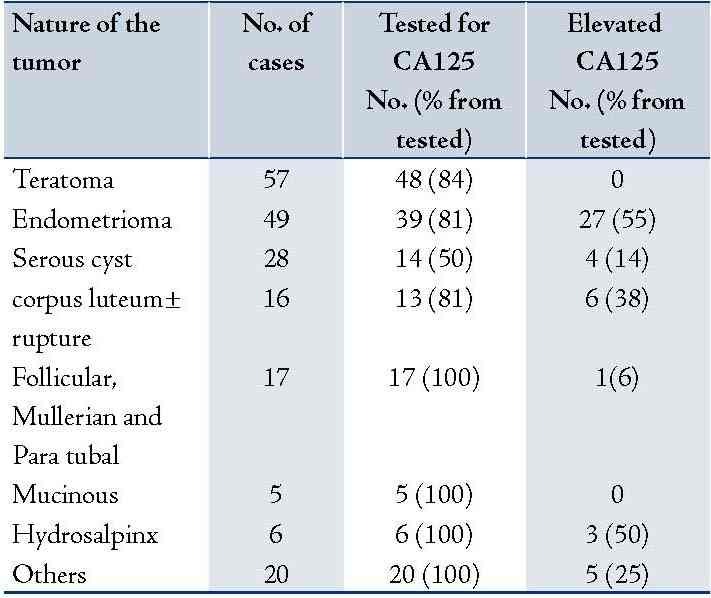 As CA125 was the most frequently elevated tumor marker it was analyzed in relation to the type of the adnexal pathology as in Table 3. Fifty five percent of patients with endometriomas who were tested were found to have an elevated CA125 and 28% of them had CA 125 more than 100 U/mL. In patients with endometriomas who had elevated CA125, the level of CA125 was higher with more severe disease and bigger size of the endometrioma (Figs. 1 and 2). The mean CA125 for stage III was 62 U/mL (range: 45-57 U/mL) and for stage IV 174 U/mL (range: 59-802 U/mL). All patients with CA125 higher than 100 U/mL had stage IV endometriosis. Pearson correlation coefficient for stage of the endometriosis and CA125 level was 0.39 and for the endometriosis tumor size and CA125 level was 0.18. There was no observed relationship between the level of CA125 and the surgical approach used as 48% (13/27) of patients with elevated CA125 had laparotomy (directly or converted from laparoscopy) and 50% (5/10) of patients with normal CA125 had laparotomy. Three patients with endometriomas had elevated CA19-9 and in all the 3 cases, endometriomas were bilateral. CA19-9 was elevated in 5 cases of mature teratomas and in all those cases the teratomas were bilateral. Table 3: CA 25 values in the various histological types. 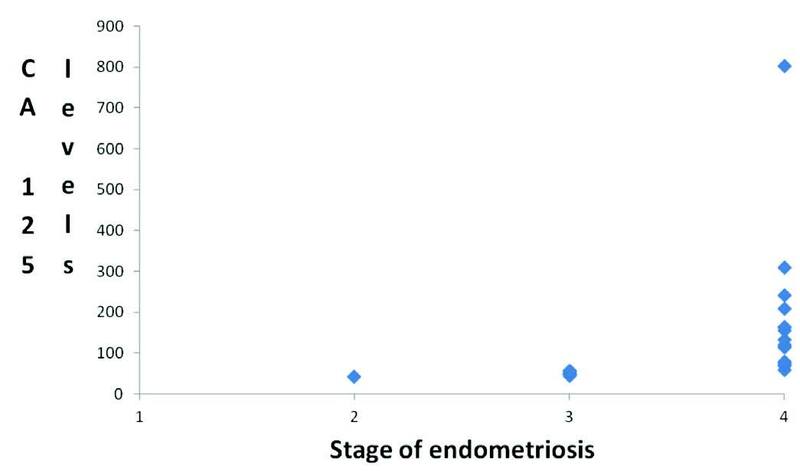 Figure 1: Endometriosis stage and CA 125 levels. Figure 2: Size of ecdometrioma and CA 125 levels. The most common benign tumor in this study was mature teratoma, much similar to other studies though Abdullah and Bondagji reported serous cystadenoma as the most common benign tumor.2,3 Laparoscopy is recognized as the standard of care for the management of benign adnexal masses as it is associated with a reduction in fever, urinary tract infection, postoperative complications, postoperative pain, number of days in hospital, and total cost according to a Cochrane review.4 The same authors mentioned that since these studies included a total of only 769 women and not all of the important outcomes were reported in each study, their conclusion has to be interpreted with caution.4 Laparoscopic management was possible only in just over 46% of patients and the reasons for laparotomy are described. Although the largest ovarian cyst in our series removed laparoscopically was 17 cm serous cystadenoma; laparoscopic removal of larger serous cyst up to 30 × 40 cm has been reported in Oman.5 Conservative ovarian surgery in the form of ovarian cystectomy to preserve fertility was possible in 72% of the women. About 79% of women had less than five children, the average family size in the Sultanate of Oman, and that goes with the fact that conservative surgery was necessary in three fourths of the women approximately. 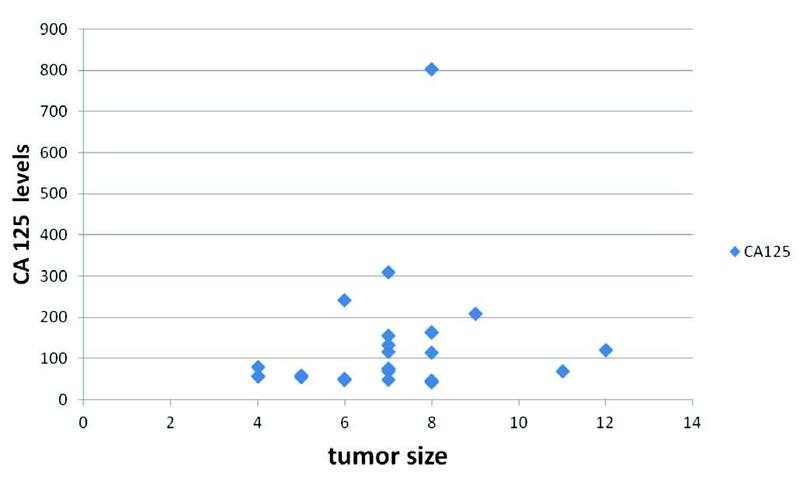 Tumor markers in the context of adnexal masses are used in practice to aid pre-operative diagnosis and surgical planning.6 The most common used tumor marker is CA125, which can be elevated in a wide range of gynecologic conditions. Some are physiological like normal menstruation and pregnancy and some are pathological malignant epithelial ovarian tumors and endometriosis.7 Other tumor markers are used in the diagnosis of other types of ovarian tumors that are malignant like LDH for dysgerminoma, AFP for yolk sac tumor and CA 19-9 for other intra-abdominal tumors like pancreas and colon.7-9 However, CA 19-9 can be elevated with mature teratomas and endometriomas.7-12 As the included population in this study were all benign adnexal masses; the frequency of elevated tumor markers other than CA125 was small. The most common benign tumor was mature teratoma but laparoscopic cystectomy (standard of care) was possible in less than 50% patients. Patients with severe endometriosis were more likely to have elevated CA125. 1. Brown DL, Dudiak KM, Laing FC. Adnexal masses: US characterization and reporting. Radiology 2010 Feb;254(2):342-354. 2. Wilczyńqski JR, Nowińska A, Szpakowski M, Nowak M, Szpakowski A, Władziński J, et al. [Laparoscopic treatment of benign ovarian tumors]. Ginekol Pol 2006 Jan;77(1):40-47. 3. Abdullah LS, Bondagji NS. Histopathological pattern of ovarian neoplasms and their age distribution in the western region of Saudi Arabia. Saudi Med J 2012 Jan;33(1):61-65. 4. Medeiros LR, Rosa DD, Bozzetti MC, Fachel JM, Furness S, Garry R, et al. Laparoscopy versus laparotomy for benign ovarian tumour. Cochrane Database Syst Rev 2009;2(2):CD004751. doi:10.1002/14651858.CD004751. 6. Granberg S, Wikland M, Friberg LG. Tumor marker CA 125 level and ovarian volume at different cycle day periods and in postmenopause. Int J Gynaecol Obstet 1990 Oct;33(2):149-152. 7. Cannistra SA. Cancer of the ovary. N Engl J Med 2004 Dec;351(24):2519-2529. 8. Muyldermans M, Cornillie FJ, Koninckx PR. CA125 and endometriosis. Hum Reprod Update 1995 Mar;1(2):173-187. 9. Dede M, Gungor S, Yenen MC, Alanbay I, Duru NK, Haşimi A. CA19-9 may have clinical significance in mature cystic teratomas of the ovary. Int J Gynecol Cancer 2006 Jan-Feb;16(1):189-193. 10. Cheng YM, Wang ST, Chou CY. Serum CA-125 in preoperative patients at high risk for endometriosis. Obstet Gynecol 2002 Mar;99(3):375-380. 11. Mol BW, Bayram N, Lijmer JG, Wiegerinck MA, Bongers MY, van der Veen F, et al. The performance of CA-125 measurement in the detection of endometriosis: a meta-analysis. Fertil Steril 1998 Dec;70(6):1101-1108. 12. Kataoka T, Watanabe Y, Hoshiai H. Retrospective evaluation of tumor markers in ovarian mature cystic teratoma and ovarian endometrioma. J Obstet Gynaecol Res 2012 Aug;38(8):1071-1076.